These fun cushion covers are a great way of adding a stylish modern touch in your living room / bedroom. 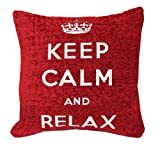 We love the slogan, ‘Keep Calm & Relax…’ Both the ‘Keep Calm’ & ‘Union Jack’ cushion covers are made from a cosy comforting cotton mix. Keep calm cushions are available in 3 delightful colours. A soft and supportive cushion to get cosy with!